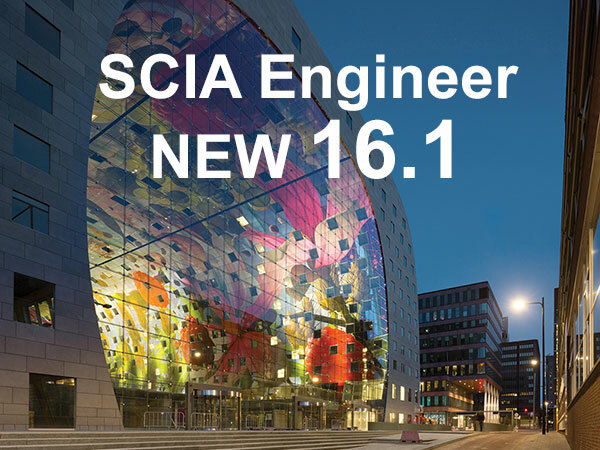 We are happy to announce the release of SCIA Engineer 16.1, the latest version of our software solution for structural design. This second release of 2016 is based primarily on a user-feedback and delivers numerous improvements and added features in many areas. The complete workflow for design of reinforced concrete beams, columns and ribs according to Eurocodes now includes automatic recalculation of required reinforcement areas into the adequate number of real rebars. The concrete Section Check is deeper integrated into the general design workflow. Design of base plates of steel columns calculates moment resistance, rotational stiffness, and takes into account the strengthening effect of the concrete block in contact with the base plate. Seismic calculations can now be performed also using the seismic spectrum according to the latest Dutch Practice NPR 9998. Recent theoretical studies and modern sheeting geometries have been implemented in the composite design. Web openings are now supported in the design of composite floors with cellular beams. Concrete slabs and floors can now be designed to ACI 318-14 with a brand new solution. US-compliant equivalent lateral forces (ELF) method has been implemented, including expanded support for ASCE 7-10 Chapter 12. SCIA continuously promotes Open BIM. In SCIA Engineer 16.1 the processing of extremely large IFC files has been optimised resulting in a dramatically faster import. The Revit link is now compatible with Revit 2017, supports import of numerical cross sections and improves the export capabilities, namely for slant columns. The new release, like all its predecessors, also offers a great variety of improvements for day-to-day work. Please visit our Resource Centre to see the complete list of new features, with technical articles, videos, etc.